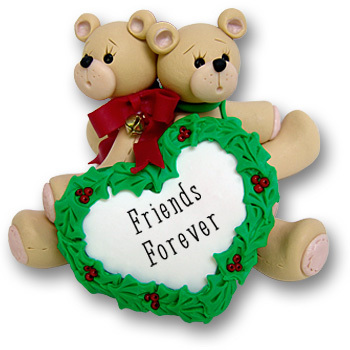 These darling little "Belly Bears" are a perfect gift for any couple. It is great when personalized for best friends, boyfriend-girlfriend, sisters, or even a married couple for their first Christmas. Handmade from polymer clay and designed by Debi Allison. This ornament comes with a hook and satin ribbon for hanging.